We so often hear of pioneers of Pan – Africanism, its fathers and its molders. It is commonly forgotten what its meaning is, its impact and necessity on the continent. Pan-Africanist ideals emerged in the late nineteenth century in response to European colonization and exploitation of the African continent. Pan-Africanist philosophy held that slavery and colonialism depended on and encouraged negative, unfounded categorizations of the race, culture, and values of African people. These destructive beliefs in turn gave birth to intensified forms of racism, the likes of which Pan-Africanism sought to eliminate. And one such great political institution that was created was that of Ghana. The face behind this first of its kind greatness was that of Kwame Nkrumah. Every mother hopes for greatness when they first hold their child in their arms. One tends to wonder what the simple retail trader Elizabeth Nyanibah (Kwame Nkrumah’s mother) imagined her son to be on the 21st of September 1909 when she gave birth to him. Born Francis Nwia Kofi Ngonloma in Nkroful, Gold Coast to a goldsmith and retail trader for parent, Nkrumah spent nine years at a Roman Catholic elementary school in the area. Dedicated to the institute of education, Kwame managed to capture the attention of Dr. Kwegyir Aggrey (Assistant vice Principal and the first African member of staff at the then Prince of Wales’ College at Achimota and secured him as a childhood mentor and looked up to him for inspiration. All this happened, as he was pursuing his teaching qualification at the school. Dr Aggrey was the first African member of the college staff and his presence at the school did much to spark the flames of nationalism in the young Nkrumah. After Aggrey’s death in 1929, Nkrumah decided to further his education in the United States of America. Despite facing five years of financial challenges to be able to leave, he successfully managed to leave and secure a B.A. degree from Lincoln University in 1939. He also received an STB (Bachelor of Sacred Theology) in 1942, a Master of Science in education from the University of Pennsylvania in 1942, and a Master of Arts in Philosophy the following year. During his lifetime, Nkrumah was awarded honorary doctorates by Lincoln University, Moscow State University, Cairo University, Jagielloniaan University in Krakow, Poland, and Humboldt University in former East Germany. In 1957, Ghana was declared free by their Prime Minister Nkrumah, as it became a Commonwealth realm. With years of hard work and political maneuvering, he declared his plans to make Ghana a republic. Dr Nkrumah was invited to serve as the General Secretary to the United Gold Coast Convention (UGCC) under Dr Joseph Boakye Danquah. He returned to Ghana in 1947 to take up the position but split from it in 1949 to form the Convention People’s party (CPP). This was the beginning of the party’s constant resistance towards its government. In 1948 Nkrumah was arrested along with other party members, after the police suspected party’s involvement in the recent riots that spurred up in Accra, Kumasi, etc. after police fired on a group of protesting ex-serviceman. After he was released, he started working vehemently towards the political and social betterment of Gold Coast. He had Cocoa farmers, trade unions and women on his side. In 1949 he formed a new party, The Convention People’s Party. Nkrumah’s belief in mobilizing as many people as possible had resulted in the raising of consciousness among Ghanaian s, many of whom soon began to articulate political demands which were ahead of the United Gold Coast Convention (UGCC). Whereas the latter’s policy was centered on “self-government within the shortest possible time`, demands were already being made for “self-government now”. 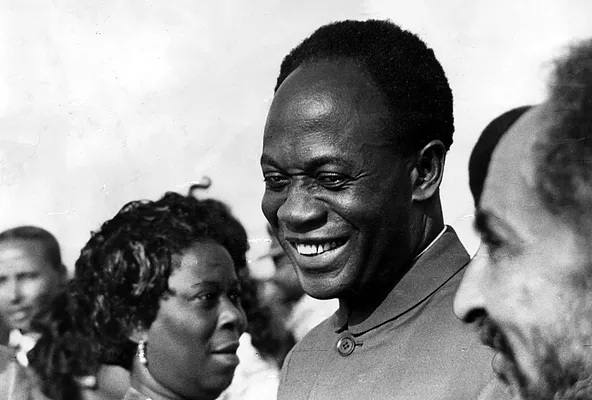 With constant imprisonments Nkrumah managed to secure the position of Prime Minister of a new independent Ghana, after the British government realized there was no doing away with him. In 1957, Ghana was declared free by their Prime Minister Nkrumah as it became a Commonwealth realm. With years of hard work and political maneuvering, he declared his plans to make Ghana a republic. 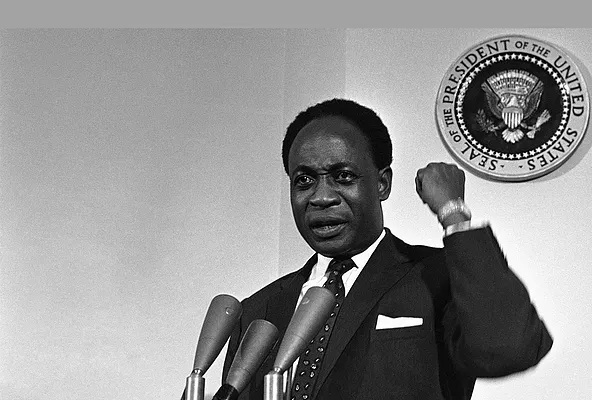 The presidential election and plebiscite on the constitution were held in 1960 and the constitution was changed, which led to Dr. Nkrumah’s election as the President of Ghana. Ghanaian sovereignty was surrendered to a Union of African States. Martin Luther King, Jr., and his wife Coretta Scott King were some of the notable guests that traveled to West Africa to attend Ghana’s independence ceremony. King’s voyage was symbolic of a growing global alliance of oppressed peoples and was strategically well timed; his attendance represented an attempt to broaden the scope of the civil rights struggle in the United States on the heels of the successful Montgomery bus boycott. King identified with Ghana’s struggle; furthermore, he recognized a strong parallel between resistance against European colonialism in Africa and the struggle against racism in the United States. The economic legacies of President Nkrumah include the building of Tema township, the Accra-Tema Motorway, Komfo Anokye Hospital in Kumasi, University of Science and Technology, University of Cape Coast, polytechnics and second school around the country, Akosombo Dam, Adome bridge etc. As a man passionate about education, since President Nkrumah, no other government in Ghana has embarked on such a massive infrastructural development. Clearly, some of the infrastructures listed above still remain the main infrastructure in many sectors of Ghana. Notwithstanding the above economic legacies, it has been suggested that when President Nkrumah became the leader of Ghana, the country had much more promising economy compared to places like Ivory Coast. But no great man comes without faults; President Nkrumah based substantial part of his development projects on the socialist model, which was usually inferior in quality to the western standards. Thus, some of the factories that he established would in the long run not be viable. He wasted a lot of money on his security, including using external nationalities as part of his secret service. He also wasted money on his ideological school, which trained the young people he indoctrinated through his young pioneer movement. President Nkrumah also gave about 10 million pounds of Ghana money to Guinea because they were rebelling against France. Consequently, France withdrew its financial support to Guinea. This was a very inappropriate and reckless decision, which should undoubtedly, remains the most serious financial loss caused to the nation of Ghana. Ten million pounds in 1960s translates to more than 450 million pounds in the value of today’s currency, assuming the amount has been invested and earning an average interest rate of 10% per year. It appears that ability of President Nkrumah to build a lot of infrastructure in the early 1960s was primarily due to the enormous amount of money his government inherited from the British and the high international price of cocoa at the time. However, when the international price of cocoa begun to crush, he was unable to meet the challenges the economy faced. Further, rampant corruption among his ministers and some poor economic planning also contributed to his economic failure. From 1960 onwards Dr Nkrumah begun to suppress all forms of opposition, firstly, by outlawing regional based political parties in Ashantiland, the North and the Volta region. The opposition parties had no choice but to come together. As the opposition parties came together under one umbrella, Dr Nkrumah used his parliamentary majority to ban all form of opposition and declared Ghana a one party state, and all forms of criticism, including constructive ones, were utterly suppressed. By and large, the situation grew so bad that the opponents were brutally suppressed and people like Dr J B Danquah were detained at Nsawam prison till they died. In February 1966, soon after inaugurating the Volta Dam, Kwame Nkrumah left on a peace mission to end the Vietnam War, accompanied by senior members of his Government. On 24 February 1966, in his absence, he was overthrown by a military coup. A junta of army and police officers, the National Liberation Council (NLC), took over power and the CPP, cut off by now from the ordinary people who suffered from an increasingly bad economic situation, collapsed utterly. With deteriorating health, President Nkrumah was exiled to Bucharest, Romania and eventually died in 1972. There was prolonged mourning in Ghana. “By far the greatest wrong which the departing colonialists inflicted on us, and which we now continue to inflict on ourselves in our present state of disunity, was to leave us divided into economically unviable States which bear no possibility of real development….”. Kwame Nkrumah’s contribution to Africa shall never be forgotten.